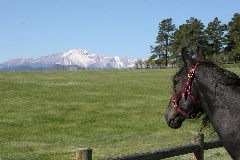 We moved to the wonderful state of Colorado in 2006 knowing very little about horses and even less about how to take care of them. We did know that we wanted to share our lives with these magnificent creatures and so we began taking horsemanship lessons. There was a lot to learn and we started off taking weekly lessons. We rode a bit and worked on the ground grooming and learning how and where to stand, how to groom, clean feet and then we met Lacey. She was just broken physically and mentally, and she looked terribly thin to me. I was in love and just knew she should be mine, but lacked the skills and confidence to do anything about it. We continued to take lessons and every week I would spend a little extra time with her. We had been taking lessons for a couple of months when I finally worked up the courage to ask about Lacey. 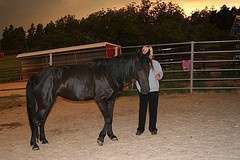 Lacey had been abused as a filly and was now being cared for by the folks where we learning horsemanship. They had intended to help her heal and then use her in their program, but she was failing to thrive so they said if I wanted her she was mine. Within weeks my family and I had the barn and paddocks here cleaned up and ready for her arrival. I knew enough at that point that horses are not meant to live alone, but lacking the confidence to deal with more than one rescue at a time, we added our beginner friendly gypsy vanners, Bill and Lampert, to keep her company. When Lacey came home to us, she was clearly as uncomfortable as we were. I know now she sensed our utter lack of confidence and just how scared we were. I watched her pace, run, buck, and rear in her paddock for a couple weeks in an absolute panic, what had I gotten myself into? In time though, we got more comfortable around each other, I spent hours just sitting in her paddock and then eventually grooming and playing with her in hand. 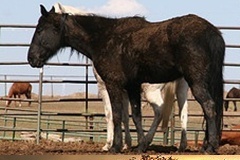 When Lacey was a filly, her owner had a tied her to a tractor to get her to lead. It caused some neurological damage and I was told before I brought her home, that she could never be ridden. That was fine by me, I just wanted to give her a nice home and to love her. 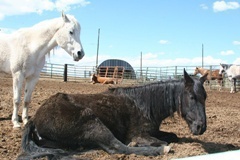 We played on the ground for a while, and then we started equine massage therapy and eventually some chiropractic work. I brought her home in May, physically and mentally broken and by fall of that year, she was a healthy, happy, relaxed horse. My sister brought a friend with small children here to meet the horses one afternoon that fall, and my Lacey stood with those little ones and didn’t move a muscle, she just knew how fragile they were. I was so proud of her and just amazed that we could make such a difference in the lives of these beautiful creatures. In November that year, the vet told me that she thought Lacey was healthy, physically and mentally ready to start under saddle training. I was thrilled beyond words, I believe that she was my equine partner. 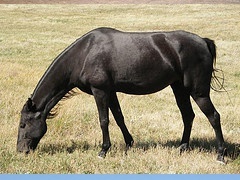 We had plans to start her under saddle the next spring. In December, my husband went out to check on the horses one more time before we headed out for the evening. He called me from the barn in a panic, Lacey was laying down and was unresponsive. I ran up to check, and she was clearly struggling with colic. We called the vet, and he was on the way when she died. I can still remember everything we did that night to try and get her up and moving, but it was just too late. We all take comfort in knowing that the last seven months of her life were good and that she was happy here. Lacey taught us all so much and her legacy lives on in The Lacey Foundation.